That's why our leaders should never never say that they are entitled to be paid millions and peg their salaries to the top earners in the private sector. If the leaders do this, everyone else will follow - private sector CEOs to hawker stall owners. Everyone wants to be paid more. 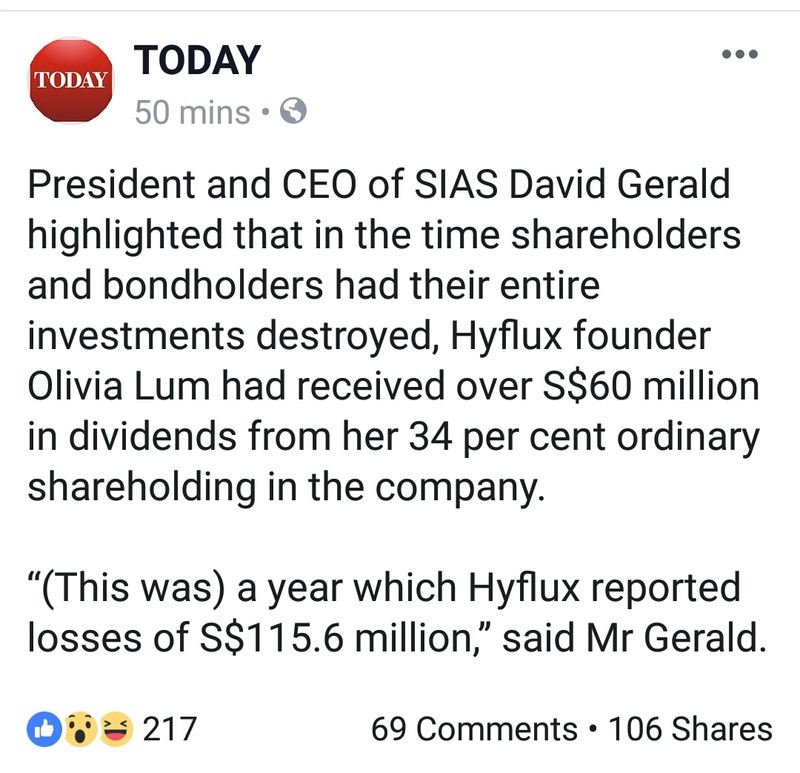 If poorly managed Hyflux can pay its CEO $60M, why can't our ministers justify another round of adjustment for themselves? Everyday, there are new losses from overseas plant where they have to produce and delivery desalinated water or face penalties. sudoku said: Everyday, there are new losses from overseas plant where they have to produce and delivery desalinated water or face penalties. Overseas business is negligible. Tuaspring alone is the main killer of Hyflux. 15th Feb is when Hyflux will know its fate, right ? Honestboy said: Overseas business is negligible. Tuaspring alone is the main killer of Hyflux. Yes this killer Spring is the main culprit that drain off Hyfark money, heard each day or month Hyfark is losing $10M. i suspect their overseas operations losing buckets of money everyday. Anyway, a writer to ST asked to delay the liquidation until investigation is done. very foolish when they are losing money everyday. sudoku said: i suspect their overseas operations losing buckets of money everyday. Tuaspring is the main killer. Overseas projects are negligible. Go read the financial reports. company losing million of dollar, can benchmark hyflux and demand to pay out bonuses? Current time: 23-4-2019, 12:09 AM Powered By MyBB, © 2002-2019 MyBB Group.